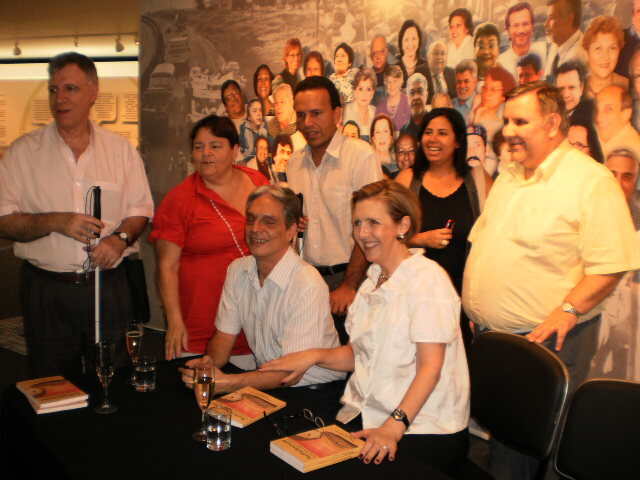 The first book written in Brazil about audio description was launched yesterday (February 24th, 2011) at Secretaria dos Direitos da Pessoa com Deficiência do Estado de São Paulo. It is a collection of articles and testimonials of audio describers, of people working with cultural accessibility and of visually impaired people who are users of this resource. The book is a milestone in the history of Brazilian audio description; it is a file that shows how we work with audio description in plays, operas, films, documentaries, commercials, movies festivals. Besides that, it is a book that brings out the discussion about the training of audio describes, the Brazilian and the world scenery and history, the so controversial issue of implementation of the toolon Brazilian TV, the laws, decrees and ordinances and finally what visually impaired people think about this resource. With preface written by Marco Antonio de Queiróz, introduction by Lívia Motta and Paulo Romeu, back cover by Linamara Batistella, the book is divided into three parts. 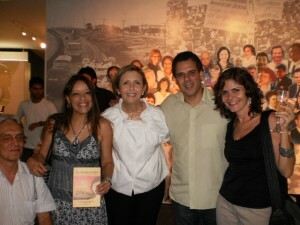 In the first part we can read the articles written by Paulo Romeu (São Paulo), Eliana Franco and Manoela Cristina (Salvador), Lívia Motta (São Paulo), Graciela Pozzobon (Rio de Janeiro), Vera Santiago (Fortaleza), Lara Pozzobon (Rio de Janeiro), Maurício Santana (São Paulo), Rodrigo Campos (Belo Horizonte), Bell Machado (Campinas), Laercio Sant´Anna (São Paulo), Iracema Vilaronga (Salvador), Naziberto Lopes (São Paulo), Luis Fernando Guggenberger and Eduardo Valente (São Paulo) and Marta Gil (São Paulo). In the second part, entitled: A primeira audiodescrição a gente nunca esquece (The first audio description we can never forget), one can read the testimonials from visual impairment people: Sidney Tobias (São Paulo), Joana Belarmino (João Pessoa), Elizabet Dias de Sá (Belo Horizonte), Cristiana Mello Cerchiari (São Paulo), Lothar Bazzanella (São Paulo), Antonio Carlos Barqueiro (São Paulo), Marcos André Leandro (São Paulo), Roger Marques (São Paulo) and Jucilene Braga (São Paulo). In the third and last part, entitled: Olhos que falam (Speaking eyes), we can find the audio describers’ testimonials: Letícia Schwartz (Porto Alegre), Leo Rossi (Piracicaba), Carlos Eduardo Marçal (São Paulo), Marli Fernanda Nunes (São Paulo), Milena Leite (São Paulo), Pilar Garcia (São Paulo) Rosilene Almeida (São Paulo), Rosângela Barqueiro (São Paulo), Ana Maria Campanha (São Paulo) Ana Maria Rebouças (São Paulo), Camila Feltre (São Paulo), Carmita Muylaert (São Paulo), Íris Fernandes (São Paulo), Lizette Negreiros (São Paulo) anda Maria Adelaide Pontes (São Paulo). We hope this material can be useful in the training of new audio describers and an information tool about this fantastic cultural and communicative accessibility resource to the public in general. We also expect itcan open up new paths, bringing new perspectives to Brazilian audio description. Cheers to all of you who made this dream come true!!! Olá! Gostaria de saber onde posso adquirir este material. Obrigada por sua visita ao VER COM PALAVRAS. O livro foi não está a venda. Ele foi publicado pela Secretaria dos Direitos da Pessoa com Deficiência do Estado de São Paulo e está disponível para download no site em LIVRO, em diversos formatos.